Mordy Oberstein spotted Google adding a box to the search results titled "latest from the web" which seems to include radio shows about the search query. 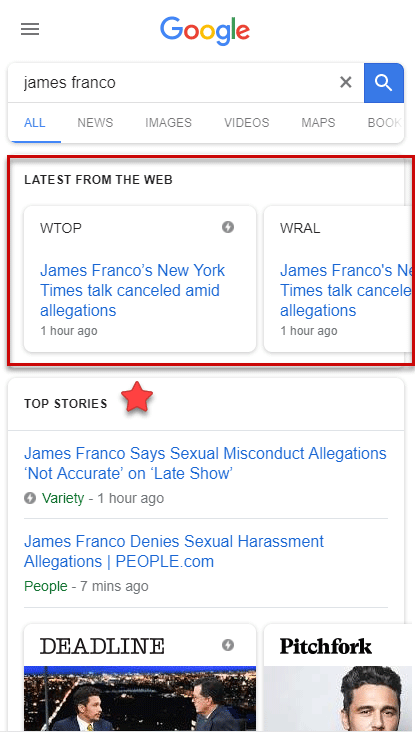 This box was on top of the typical "top stories" box and carousel, they both seem to show AMP pages, but the latest from the web seems to just show radio web sites, according to Mordy. Here is his screen shot on Twitter. I tried to replicate it, but I am unable to bring up this box from my devices. It does look familiar, but I don't think I covered this feature here before. Have any of you ever seen it?